Sony has officially announced the design of their new PlayStation Store and boy does it look familiar. The interface is entirely designed around the concept of Live Tiles, the basis of the new Microsoft Modern UI principle. The concept is currently available on the Xbox Dashboard and Windows Phone 7. It started its life in the now retired Zune and will be making its desktop debut with Windows 8 later this month. Sony is not the first company to believe Microsoft really has something with its Modern UI. Google has implemented the concept in its Google Play store as well as YouTube. We have even seen Apple implement it in the iOS6 App Store. The interface, pictured after the break, is laid out is a way that makes the store actually useful. The current store is nearly impossible to navigate, especially if your intention is to navigate backwards, so a change like this will make life a lot easier for a lot of people. The store is separated into the usual sections, with the addition of media content being available all from the same store. In fact, over 100,000 videos and TV shows will be available from the redesigned store. Not everything is getting a face lift, however. Hit the break for that and a photo of the new store. There comes a time in every journalist's life where he must admit he is wrong. That time has arrived for me. I am wrong about the iPhone 5. While the phone has done a lot of good for the deployment of more 4G LTE, there has been the scratch and dent fiasco and the Apple Maps disaster that has plagued this product since launch day. I was wrong when I said Apple wouldn't blame the customer for a problem with the device. I apologize, as I should have known better. This week, Apple has essentially blamed customers for holding the iPhone wrong, again. This time, it's when you want to take a picture. You know the purple halos you're seeing when you take a picture with a bright light coming from off-screen? Yeah, Apple says those are normal and completely expected. Instead of owning up to the problem, Apple has said that you hold the phone in a different manner or angle it differently to get a better picture. In fact, they have said that many small cameras have this problem. Looking through pictures from my Palm Pre and even my five-year-old Samsung A920, I've yet to encounter this issue. 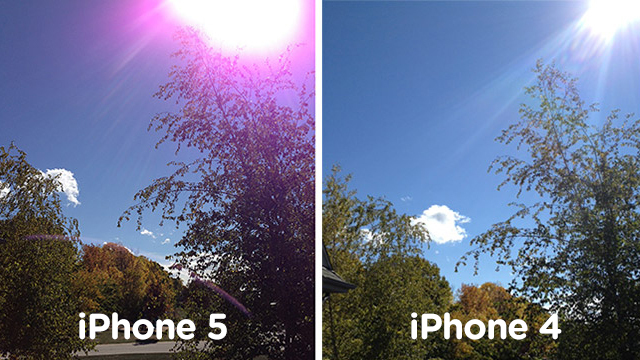 Most small cameras, including those in every generation of iPhone, may exhibit some form of flare at the edge of the frame when capturing an image with out-of-scene light sources... Moving the camera slightly to change the position at which the bright light is entering the lens, or shielding the lens with your hand, should minimize or eliminate the effect. An official response from AppleCare rep Debby says that this purple flare is totally fine. So there you have it. Apple's stance on the matter is based solely on the fact that nobody should ever take pictures when there's a big, giant burning star in the sky called the Sun. I've also heard that there is a new trend forming in Cupertino that involves taking photos by candle light only. This is further proof of my belief that Apple is fully complacent with the state of the company and truly believes (and it has been proven) their customers will buy whatever product they put out, even with the amount of problems that have already been shown with the iPhone 5. It is a sad but true fact. Does this finally outrage you enough to not buy the iPhone 5? Do you already have one and are now regretting it? Vent your frustrations in the comments below. Article image courtesy of Gawker Assets. Despite the FCC's feelings, Bing has decided that online journalists can be experts in their particular fields and have decided to add us to the social bar on the right-hand side of your search results. In the future, as you search for topics of importance, in addition to your social network connections and the things they have said about the topic, you will also see high profile journalists and the things they have said on the topic. This is a great way for Bing to bring together their standard search results, their social results and Bing News into one simple search process. It is also a great way for Bing to continue to grow their marketshare along with the Bing it On challenge and a fairly well-crafted advertising campaign. Microsoft has obviously learned from Google's mistakes of tailoring their search results based on Facebook likes, Twitter tweets and Google+ shares from your friends. Because of their difference in incorporating social results, Bing seems to have emerged as the leader in relevance, something no one ever thought Google would lose. For more information on the new search feature, hit the break. When Blockbuster Video failed and auctioned off its assets, finally purchased by Dish Network, the question was, what would Dish Network do with the company and brand? Would they keep stores open, or would they be destined to close them down? Would they focus on in-store rentals or give up on that business? The answer came with an announcement to offer a rental and streaming service to compete with Netflix, the company that caused all of the trouble for Blockbuster in the first place. While it seemed that a Netflix-style service with the Blockbuster name could possibly be a success. There is a certain image you get when you think of Blockbuster, and that is of a well-stocked store filled with classic titles as well as new releases, and Dish Network had hoped that would translate to a thought of a well-stocked video streaming service. Unfortunately for Dish, that was not the case. This week, they have announced that the business plan has not been successful and they will pull the plug on it entirely. Hit the break to find out what this means for Blockbuster. Bad Piggies, the latest game in the Angry Birds franchise, has become the biggest download in both the Apple App Store and Google Play. One place this popular title is missing is online. Rovio decided not to create a Chrome Store version of the game or an online playable version. If you were to take a look in the Chrome store, however, and not pay any attention to detail, you would have no idea because of the dozen or so impostors. While impostor software is a problem in general, especially in the open app stores (Google Play and Chrome in particular), these pose an even bigger problem. According to Barracuda Networks, these fake titles all contain malware and have, as of now, affected upwards of 100,000 Chrome users. Once infected, the user's browser will display ads in places where they are not intended to be, and certainly not provided by the content producers whose page they appear on. Hit the break for information on the malware and how you can prevent it on your computer. The announcement of T-Mobile's planned purchase of MetroPCS may have come as a surprise to most of the industry, though it shouldn't have. It has also stirred up some old emotions with an ex-suitor of MetroPCS, Sprint. A few months ago, we found out that Sprint had considered purchasing the carrier. Apparently jealousy has reared its ugly head and Sprint's board of directors will spend the weekend and early next week discussing whether or not to outbid T-Mobile for the country's 5th largest carrier. While the purchase won't quite knock anyone out of its ranking position like Verizon's purchase of Alltel, it would help Sprint in expanding its LTE network quicker than its current strategy. It would also prevent T-Mobile from creeping into Sprint's territory, both in 3rd place ranking and in prepaid marketshare, which is something that is very important to Sprint's survival in the overly competitive wireless industry. A T-Mobile buyout of MetroPCS would put them in a position to challenge Virgin Mobile and Boost Mobile's ownership of the prepaid industry. Sprint relies on their prepaid offerings to help deal with the financial disaster that has been the Clearwire partnership. The last thing they need is T-Mobile offering a service that could challenge their WiMax escape plan. This story will be more interesting to follow than the failed AT&T buyout of T-Mobile.